The other day Apprising Ministries was sent the video at the bottom of this post which, with no further information available at the time, I originally ran as Christian Ordination Or Really Bad Off-Broadway Musical? When the Louie Giglio mess happened I was so jammed up with that situation I hadn’t had time to get back to this ordination ceremony. My friend Jake Elliott of C3 Church Watch filled me in as to the man who’s presiding. Turns out it’s a Word Faith wingnut by the name of “Bishop” Wayne T. Jackson. 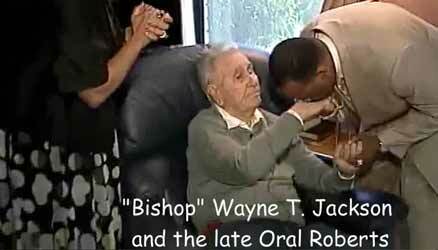 Above you can see Jackson paying homage to the late Oral Roberts during Jackson’s 2009 “impartation” ceremony at the faith healer’s home. Actually, the first half of the video below captures the event, with the second half a peek at Jackson in action. From the looks of it, I’d say he’s a C-list prophet-healer; kind of a combination of T.D. Jakes and Benny Hinn. Well, brother; you got the full load. You, you’ve got all I could give you… You came with a humble, seeking spirit, and you received. O, the Lord’s presence is here today. I love you so dearly. Prophetically, Bishop Jackson has accurately spoken the prophetic Word of God directly into the lives of thousands of people; including celebrities, key political figures, titans of business and industry, and the overall Body of Christ. God has also smiled on Bishop Jackson and has blessed him with entrepreneurial savvy. Perversion has hit the black church with a vengeance and it doesn’t seem to be coming from the pews. In Detroit, Bishop Wayne T. Jackson of Great Faith Ministries conducted a bishop’s “consecration” event for two men. In an astonishing act of raw perversion, Jackson first tells the two men to get on their knees. After they submissively do so, he waves his hand indicating they are to lay face down on the floor of the church in front of a crowd of people (and presumably their wives and children). After the men have laid face down, Jackson calls for his assistants to cover them with large white cloths which he explains that “You gotta be buried. You gotta die. So that Christ can live in you. Be prepared for burial”. The men are completely covered and Jackson grabs the ankles of the first man and acts as if he is praying. As you’ll see in the video below Jackson actually lays on top of each man in a most bizarre ordination ceremony. Sadly, now consider that his is the kind of spiritually whacked ministry you’ll see more of as Word Faith Heretics Like Creflo Dollar Draw Nearer To Evangelical Acceptance.